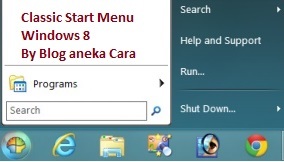 Anda mungkin sudah terbiasa dengan windows 7, windows xp atau vista yang memiliki start menu dan tampilan antar muka sangat berbeda dengan windows 8. Agar tidak ribet dan mudah mengembalikan menu "start" di windows 8, kamu bisa memakai tools/ software khusus dibawah ini dan semuanya gratis tidak perlu bayar segala. • Has support for skins, including additional 3rd party skins. Make your own! 2) Go to the View menu and select Toolbars -> “Classic Explorer Bar” to show the toolbar. 3) If that option is not available (you only see “Lock the Toolbars”) you may have to enable the plugin from Internet Explorer. Run IE, right click on its toolbar and select “Classic Explorer Bar”. It will ask you if you want to enable this add-on. Select “Enable”, then do steps 1 and 2 again. 4) If that doesn’t work, try going to Tools -> Manage addons in Internet Explorer. Locate the addons “Classic Explorer Bar” and “ExplorerBHO Class” and make sure they are enabled. 5) If even then you don't see the toolbar, maybe the browser extensions are disabled on your system. This is usually the default for servers. Open the "Internet Options", go to the "Advanced" tab, and check the option "Enable third-party browser extensions". It goes without saying (but I’ll say it anyway!) that you have to turn on the status bar from the View menu if you want to see the file sizes.